Skipper Tom Heaton believes that results will come away from home should the Clarets maintain their recent performance levels. Sean Dyche’s side have certainly been up against it in recent weeks on the road in the Premier League with trips to White Hart Lane, the Etihad and the Emirates. 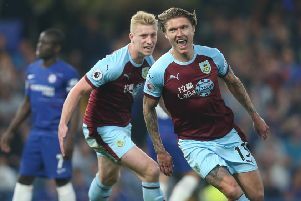 But Burnley acquitted themselves incredibly well in those fixtures and were unfortunate to lose out by a narrow margin against Spurs, Manchester City and, most recently, Arsenal. The Clarets lost by the same result in each of those outings, against three of the Premier League’s top five, but Heaton feels that they’re getting closer to getting the results that they deserve. Following the late heartache against the Gunners, where Alexis Sanchez’s late penalty secured a 2-1 win for the hosts, the England international said: “It’s a tough one to take and very frustrating after getting back in to the game. To concede that penalty so late on is very frustrating. “We got back in to the game, had a few chances in the first half as well, but I thought we played well. It’s a very good away performance. It’s such a sickener when you get a late equaliser and then come away with nothing. Heaton added: “Performance-wise it was excellent. We defended very well, put bodies on the line again and on top of that I thought we played some decent stuff. “The last two, three or four games away from home the performances have been a lot better and today was no different. “It’s important. These are the toughest of places to go, they’re at the top end of the market as the manager would say, but I think we’ve acquitted ourselves well. “The important thing is to keep doing that and keep getting better with the performances. That will give you an increased chance of getting the results.